I am sure that the views of Devon are very beautiful. It is just very hard to see them over the giant hedges. When you are only five foot three and a half and riding on a small bicycle then you have to enjoy glimpses of the landscape where the hedge breaks to make room for a gate. Mostly today I admired the hedges. Hedges ram-packed with species of bramble, nettle, gorse, elder, beech, foxglove, butterflies, and an occasional old fence post that has been taken over and reclaimed by nature such that it is now alive again. 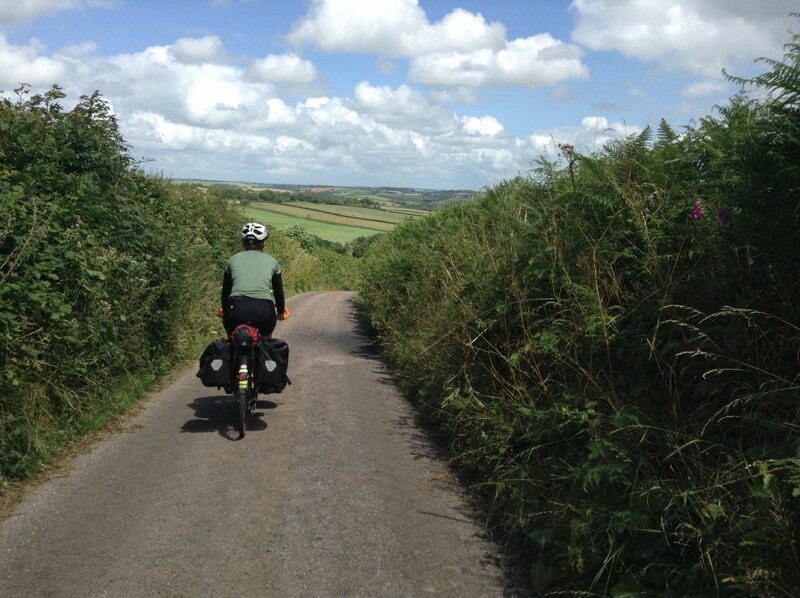 We cycled along twisty little lanes that were narrow enough that if you held out your arms straight you could have brushed the brambles on both sides with your fingertips. I didn’t though. Because my fingertips were either tightening around my brakes on a descent or gripping onto the handlebar as I pushed up yet another hill. This is my fifth bike tour in Devon. Which is silly really because there’s plenty of good cycling to be had around other parts of the UK but other than one trip through the Cotswolds (wonderful) and another through mid Wales (very wet but still wonderful) I have only cycled in Devon. I know what I’m getting now: a downhill scudding down a tiny lane so steep you fear you’ll topple over the handlebars. You can enjoy a bit of a swoop but then as the speed kicks up you come to a sharp, gravelly corner and brake. Another sharp bend, 90 degrees this time, you brake again. Hop over a small stone bridge and then crunch through all the gears on your bike as your speed quickly drops to a crawl for the ascent. Crawl, about 3mph is good, for fifteen minutes while contemplating the number of species in the hedge. Rinse, repeat.